Trinidad and Tobago national under-20 footballers Levi Garcia, Kadeem Corbin, Neveal Hackshaw, Jesus Perez and Kishun Seecharan were awarded European entry visas yesterday and are expected to travel to the Netherlands within the coming week en route to trials with undisclosed clubs in Europe. The parent clubs for 18-year-old Corbin, 19-year-old Hackshaw and 19-year-old Perez agreed verbally to the valuation of the players by Dutch agent Humphry Nijman while 18-year-old Seecharan, who is registered with Defence Force, will be allowed to move on without a transfer fee. Photo: Trinidad and Tobago winger Levi Garcia (right) bamboozles the Curaçao defence during a Caribbean Cup fixture. But the football future of 16-year-old Garcia is less certain with Nijman and the teenager’s employer, Central FC, at loggerheads over a deal for the talented winger. 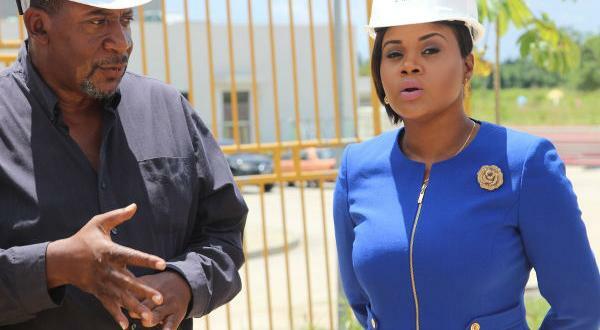 Central has so far refused Nijman’s offer for the teenaged “Soca Warrior” while the agent, for now, is not prepared to make a new one as the fight seems destined for the courts. Garcia, who is a Form Five student at Shiva Boys Hindu College, has never represented Central in a competitive match and only joined the club in March on a two-year deal. The national under-20 player supposedly indicated his intention to quit school and turn professional with the “Couva Sharks” in July. 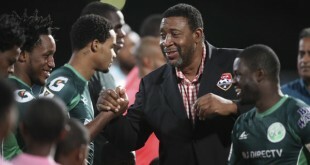 However, Garcia’s sparkling performances at the Under-20 Caribbean Cup tournament and an approach from Nijman and his local assistant, Dion Sosa, during the competition, changed his flight path considerably. Sosa and Nijman were responsible for moving Sheldon Bateau, Robert Primus and the now deceased Akeem Adams to Europe where they settled at top flight clubs in Belgium, Kazakhstan and Hungary respectively. Sosa told Wired868 their plan for the five players. “They are going to meet with their agent (Njiman) who is based in Amsterdam,” said Sosa. “From there, they will branch off to various clubs for three week trials. We will be looking for an academy for Levi because he is under age (to turn pro as a foreigner in Europe); but we are looking at first team football for the rest. 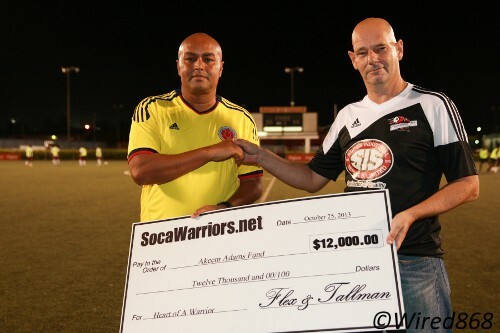 Photo: SWO member and Central FC operations director Kevin Harrison (right) presents a $12,000 replica cheque for Akeem Adams to his local manager, Dion Sosa. Adams died in December 2013 after failing to recover from a heart attack. 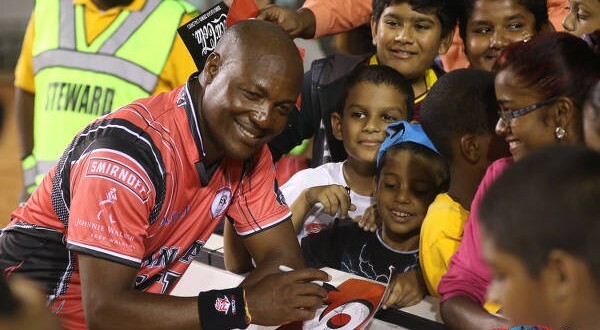 However, Central FC managing director Brent Sancho, a 2006 World Cup player with Trinidad and Tobago, insists that the Sharks do not need help in developing their players or finding them foreign opportunities. Sancho said that Central signed Yugoslav-born coach Zoran Vranes—to replace the departed Englishman Terry Fenwick—specifically because of his experience in working with youngsters. Vranes was head coach when the national under-20 team booked its place at the 2009 World Youth Cup, which was the last FIFA time that the two island republic qualified for a FIFA competition. “One of the reasons we went for Vranes as our coach is because we saw we had good young talent coming through,” said Sancho, “and Vranes is renowned for not only developing young players but also playing them… But they are filling up the boy’s head with all kind of things. 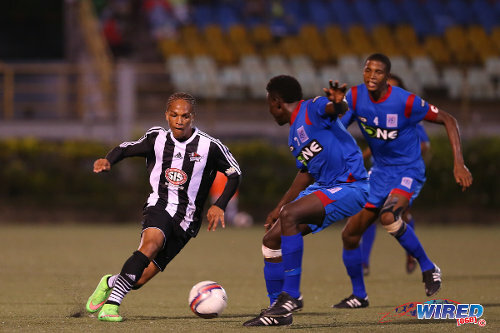 Fellow Pro League clubs St Ann’s Rangers and North East Stars took a different view to Central with regards to Nijman’s offer. Sancho claimed that Rangers accepted US$15,000 for Corbin, which was supposedly much less than the offer for Garcia. 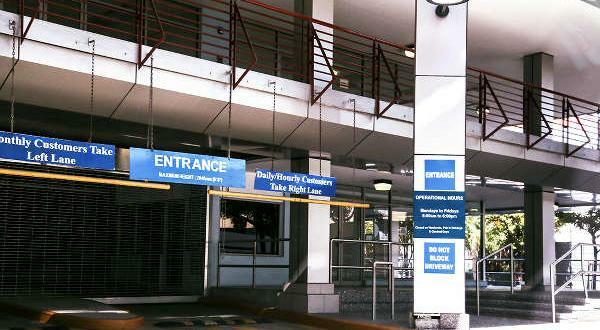 However, neither Rangers club chairman Fakoory nor Sosa confirmed that figure. 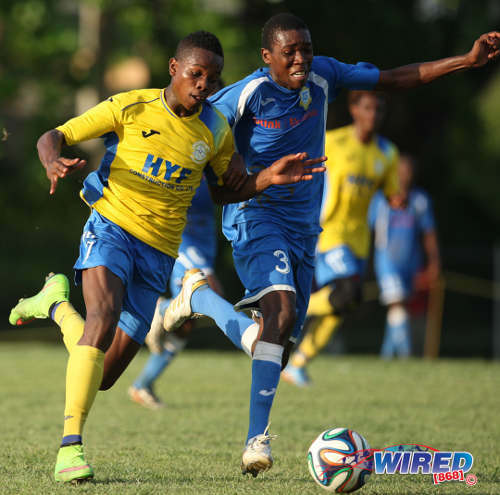 Fakoory told Wired868 that he did not want to stand in the way of his talented striker, who was named as the MVP of the Under-20 Caribbean Cup. 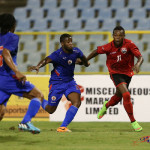 Photo: Trinidad and Tobago under-20 striker Kadeem Corbin (right) prepares to fire past Haiti goalkeeper Steve Sanon in the 2014 U-20 Caribbean Cup final. “They talked to me and made me an offer,” said Fakoory. “And since the under-20 tournament, Kadeem hasn’t showed up at practice once. So what could I do? Stars coach Angus Eve was reluctant to say much on his club’s deal with Nijman, which will see Hackshaw and Perez move to Europe for trials. But Sancho insisted that Central would not budge and he accused Nijman of underhand tactics and a contradictory approach to FIFA’s current efforts to outlaw third party ownership. Sancho said that he is happy for Nijman to take Garcia on trial and be paid for his work in negotiating personal terms. However, he is adamant that the matter of a transfer fee must only be discussed between the buying and selling clubs while he also insisted a sell-on clause would be inserted into any agreed deal. 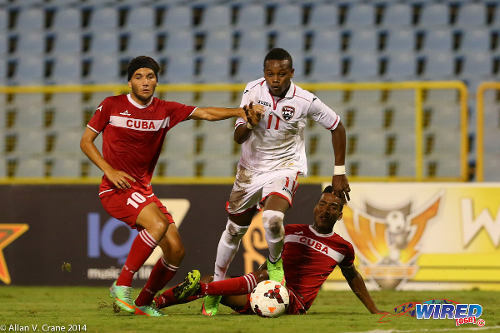 Photo: Trinidad and Tobago winger Levi Garcia (centre) steams past Cuba players Yendri Torres (right) and Roberto Peraza during the Under-20 Caribbean Cup. His stance was supported by DIRECTV W Connection president David John Williams, who pocketed well over $1 million when Kenwyne Jones moved from Southampton to Premiership club Sunderland due to a sell-on clause. “Why should a (European) club pay, house, develop and take care of Levi and, three years down the line, be forced to give Central money for doing absolutely nothing?” asked Sosa. “That is unfair to the (new) club because they are taking all the risk… Why should (Central) get 10 percent for a player they never developed in the first place? 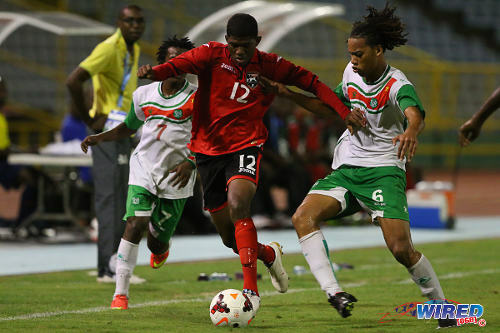 Photo: Trinidad and Tobago midfielder Kishun Seecharan (centre) holds off Suriname player Ervin Slagveer during the 2014 Under-20 Caribbean Cup. Sosa warned that Central could lose Garcia for nothing as the agents are set to challenge the validity of its contract with the player. Garcia’s elder brother, Daniel, accompanied the young man when he signed his professional contract with Central and not his parents. But Sosa is certain that Daniel is no position to sign as his younger brother’s guardian. 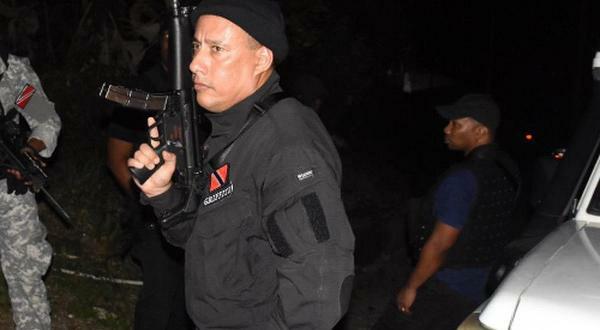 “It is an agreement which was entered into without the consent of his parent and that by itself is illegal,” said Sosa. “No minor anywhere in the free world can enter into a contract without the written consent of his parent; and neither his mother nor his father’s names are on the contract. Garcia’s mother, Judith Garcia, confirmed that she did not sign an agreement with Central. Photo: Central FC attacker Nathaniel Garcia (left) runs at St Ann’s Rangers defenders Trevin Latapy (centre) and Jelani Peters. Nathaniel is also an older brother of Levi Garcia. Central director of operations, Kevin Harrison, acknowledged that Garcia’s parents did not sign their son’s contract but explained why he felt the Sharks still had a claim on the boy’s future. “(Levi) brought an adult to meet us who wasn’t a minor and who understood everything (about the contract),” said Harrison. “His parents sat in our office several times after that and they never said they didn’t want him to play with us. So if they are trying to say they didn’t give us permission they would be lying. But Sosa believes Central’s attitude can only harm the player and is ultimately counter-productive. “Between his parents and ourselves, we are trying to sort it out in a cordial manner,” he said. “And, if not, we will do what we have to. Levi does not want to play with Central. Garcia’s present teammates at Shiva would be happy to win the Secondary Schools Football League (SSL) Premier title while his classmates are preparing themselves for CXC examinations next May. Photo: Presentation College (San Fernando) defender Kori Cupid (right) tries to keep up with Shiva Boys attacker Levi Garcia. Garcia chose to play for Shiva instead of Central this season. Meanwhile, Garcia is enduring a tumultuous start to his life as a professional sportsman. It is not the sort of tug of war that most footballers are exposed to at the age of 16. 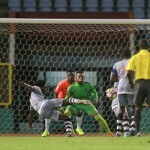 Almost certainly, Garcia’s impasse with Central has already cost him the chance of an international senior debut during next week’s Caribbean Cup qualifiers as head coach Stephen Hart was unimpressed by his decision to represent Shiva in the SSFL rather than Central in the Pro League. Garcia will hope to make up for that in Europe; providing that Sancho and Nijman come to an agreement. 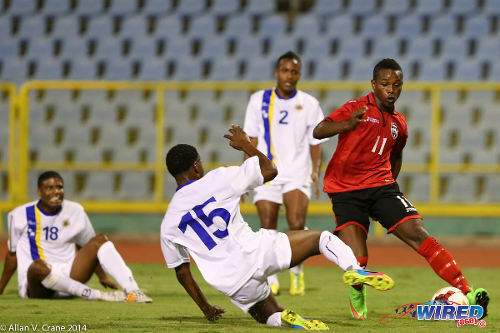 Can FIFA blank T&T starlet Levi Garcia’s move to Europe?